There is nothing vanilla about Kansha Creamery, where simple ice cream conquers world hunger and cravings. James Marumoto scoop the Mr. Universe flavor from the freezer that doubles as the daily menu. Kansha Creamery sits at the corner end of a shopping plaza on Torrance’s bustling Western Avenue and 186th Street. Inside the South Bay shop are a few tables and cushioned chairs, as well as one wall decorated with a few pictures frames but not much else. Beside the register and front counter sits a large freezer, a treasure chest of flavors. Here, siblings Elaine, 24, and James, 20, Marumoto opened their first ice shop together earlier this year without any business experience, no capitol, plenty of skepticism and a scoop of ice cream. “When you want to achieve something, you just have to take a leap of faith and keep going,” Elaine Marumoto says. For many years, James Marumoto made ice cream from his kitchen at home for family and friends as a sort of hobby. What was a casual “what-if” conversation between siblings turned into lines of people at 9 p.m. on weeknights, waiting for a scoop of James’ once-hobby ice cream creations. Today, the shop serves anywhere from eight to 10 flavors daily. Favorites include House Vanilla, Matcha, Earl Grey and Dairy-Free Chocolate Sorbet. Everything inside the treasure chest of a freezer is homemade using local organic ingredients as is expected these days. Beware, as flavors change weekly. Currently, Salted Caramel and Mint Chip are on rotation at the shop and are only available for a limited time. With new brands and parlors such as Carmela, Jeni’s, Quenelle Scoops and Sweet Rose in Los Angeles — all boasting premium ingredients and eccentric menu items — Kansha Creamery calls back to the simple and classic ice cream flavors. At first glance, the scoops here seem a little too simple and maybe even boring, but customer favorites like Mr. Universe prove otherwise. This cosmic creation churns out the deep dairy flavors from the cream with a small vanilla note, proving to be neither too sweet nor too rich. Inside are generous pieces of oatmeal cookie and a gentle caramel ribbon, evading the faux-syruplike texture that caramel can sometimes have. Be sure to make the most out of “Treat Yoself Tuesday” for a double scoop at $3.75 or triple at $5.50. Otherwise, regular prices start at $3.75 for a single and $5.50 for a double. Different flavors for multiple scoops is allowed, and customers can purchase flavors by the pint for $9. Waffle cones are an extra 75 cents. 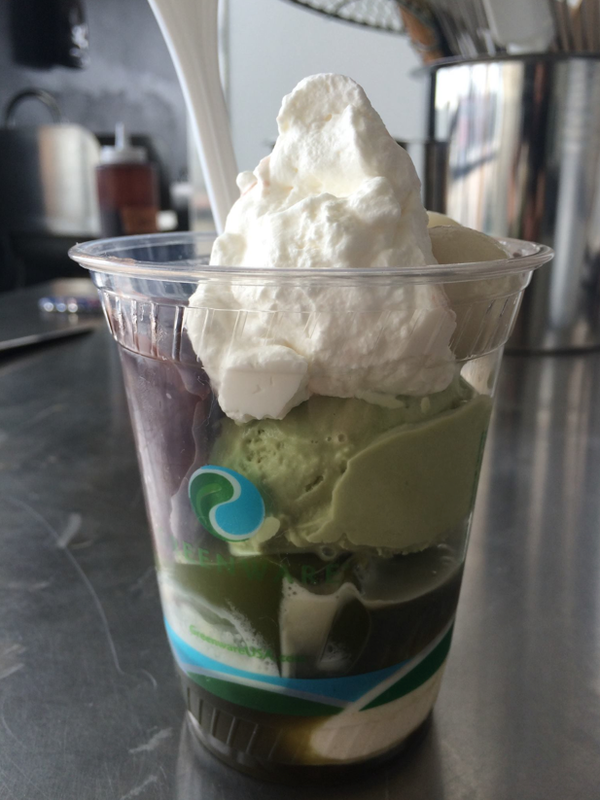 Currently, Matcha Parfaits are available for $7.25, a steep price for a sundae, but rest assured, each cup is a stacked heavenly layer of whipped cream, Matcha ice cream, anko (red bean), corn flakes, shiratama (mocha), matcha jelly and matcha syrup. Other menu items have included Lemon Tart, made from lemon curd and shortbread crumb. A customer had brought in a sack of lemons from home and the rest was history. While the flavor was short-lived, many customers continue to return asking for more. Flavors and sundae combinations come and go. While some like House Vanilla are a guaranteed scoop, many flavors are on rotation, depending on which organic and fresh items are available that day. At Kansha Creamery, the menu items are spontaneous, balancing together the weather and ingredients. “Everything is planned pretty much last minute,” James admitted. Together, he and Elaine visit local farmers’ markets, picking fresh ingredients and whatever else the weather might call for. There isn’t a designated menu calendar. With ingredients in hand, the mix-ins are added to the cream, a silky smooth dairy product from Straus Family Creamery, which is based in Marshall, Calif. The batches are left to sit over night until the next morning, where they are then churned with care and patience, incorporating as much air as possible in between folds to create a better texture. Finally, the batches are then left to sit for another night inside the freezer before being served the following day to customers. Flavors like bacon bourbon butterscotch dubbed the “Bacon on the Rocks” might occasionally find its way onto the menu, but that’s as wild as it gets. The shop’s name “kansha” is the Japanese word for “gratitude,” reflecting the creamery’s mission to give back to those in need. According to Elaine and James, the shop’s true mission is to give back to charity groups such as the Children’s Hunger Fund. As a result, 50 cents from every purchase made at Kansha Creamery is donated to charity. 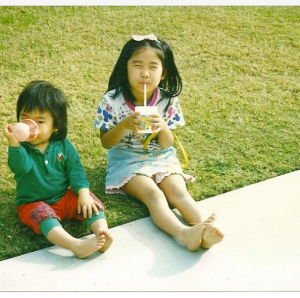 From the beginning, Elaine and James were inspired by ice cream’s ability to bring people together and create sweet moments. For them, harnessing that simple goodness was just as important as sharing their success with those in need. Back in 2013, they wanted to give back to charities but were having trouble doing so with the multiple jobs they carried. Elaine was a private piano instructor, babysitter, housekeeper and waitress, while James worked at multiple restaurants and a bakery. Neither had a business background. In fact, James dropped out after his freshman year at Narvon High School in 2010, and Elaine’s time at the Berklee College of Music in Boston was short-lived before returning home to finish her AA at Los Angeles Harbor College in Wilmington, Calif.
At first, friends and family were doubtful and even worried about the duo’s business idea. The brother-sister team had trouble finding funds and were denied several small business loans by banks. Even after working multiple jobs for two years, they didn’t have enough funds to cover the business’ initial startup costs. Then last year, their parents, John and Michiko, agreed to loan Elaine and James enough to open their business. Prior to opening the creamery, both siblings volunteered on farms through the World Wide Organization for Organic Farmers (WWOOF), learning about agriculture and the people behind their ingredients. It was during this time that they had an opportunity to work and learn simultaneously on produce and dairy farms. 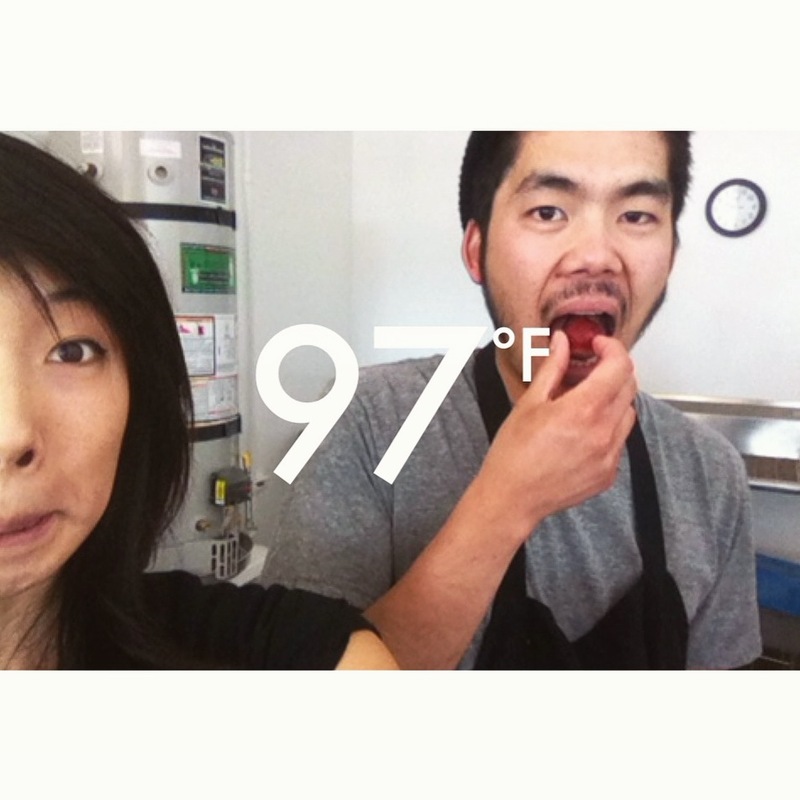 Now, Elaine and James have just one job, making ice cream and giving back to those in need at Kansha Creamery. Follow Kansha Creamery on Facebook at www.facebook.com/kanshacreamery or on Instagram at kanshacreamery to see the shop’s latest flavors before they’re gone! Visit the shop at 18515 Western Ave., Torrance, CA 90247, for a scoop or several of goodness or call (310) 953-7110 for more information and business hours.